A new U.S. spy satellite launched into orbit Wednesday (June 20), kicking off a clandestine national security mission for the National Reconnaissance Office. The NROL-38 reconnaissance spacecraft lifted off at 8:28 a.m. EDT (1228 GMT) from Space Launch Complex-41 at Cape Canaveral Air Force Station in Florida, atop a United Launch Alliance (ULA) Atlas 5 rocket. 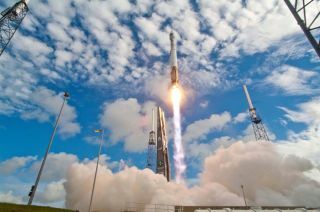 It marked a milestone flight for the rocket company, a partnership between Lockheed Martin and Boeing. "Congratulations to the NRO and to all the mission partners involved in this critical national security launch," Jim Sponnick, ULA vice president for Mission Operations, said in a statement. "This launch marks an important milestone as we celebrate the 50th successful Evolved Expendable Launch Vehicle (EELV) mission, with 31 Atlas 5 and 19 Delta 4 missions flown since August 2002." The Chantilly, Va.-based NRO manages the design, construction and operation of the United States' network of intelligence-gathering spy satellites. The NROL-38 mission will contribute toward the military's national defense program, though the details of how will be kept under wraps. Few specifics of the satellite's deign and purpose are publicly available, and the mission went into a media blackout shortly after liftoff. The launch comes just days after the end of another secret government mission, the second flight of the Air Force's classified X-37B space plane. The robotic vehicle, also known as Orbital Test Vehicle-2 (OTV-2), landed June 16 at California's Vandenberg Air Force Base, ending a 15-month mission kept largely confidential. Today's mission is the first of three NRO launches on ULA vehicles planned for the next two months. Next in line is the NROL-15 mission due to launch on a Delta 4 rocket June 28 from Space Launch Complex-37, also at Cape Canaveral Air Force Station. "Twelve of the 50 EELV launches have been NRO missions and these have been vital to our overall mission of delivering on commitments critical to our national security," said Bruce Carlson, director of the National Reconnaissance Office. "I thank and congratulate ULA and the EELV program for the tremendous performance and achievement of this very impressive and noteworthy milestone." The Atlas 5 rocket that launched today stands 191.2 feet (58.3 meters) tall and includes one main booster powered by the RD AMROSS RD-180 engine. Its Centaur upper stage was powered by a single Pratt & Whitney Rocketdyne RL10A-4 engine.